Frank Levi Holcombe was also known as Lee Holcombe.1 He was born on 26 September 1876 at Levett Twp., Oceana Co., MI. He was the son of Benjamin Levi Holcombe and Julia Melvina Newell. Frank Levi Holcombe died on 26 October 1936 at age 60. Eva Mae Holcombe was born on 1 June 1878 at Levett Twp., Oceana Co., MI. She was the daughter of Benjamin Levi Holcombe and Julia Melvina Newell. Mary Holcombe married (?) Stevens.1 Mary Holcombe was the daughter of Benjamin Levi Holcombe and Julia Melvina Newell. Dorcas Holcombe married (?) McLaren.1 Dorcas Holcombe was born on 19 November 1893 at Newfield, Oceana Co., MI. She was the daughter of Benjamin Levi Holcombe and Julia Melvina Newell. Porter and Bertha were enumerated in the 1920 Newfield, Oceana Co., MI, federal census. He was a farmer age 31; she was 30. The only child in the household was Flora, 10. Father Ben, age 65, was also in the household. Porter and Bertha were enumerated in the 1930 Leavitt, Oceana Co., MI, federal census. He was 41, she was 40, The only chid in the household was Rosalie, 2 years 10 months. [S182] Social Security Death Index (on-line), Ancestry.com, SSDI, Ancestry.com, SS5 for 371-40-9297. [S182] Social Security Death Index (on-line), Ancestry.com, SSDI, Ancestry.com, SSAN 371-40-9297. Mildred Arbutus Holcombe was born on 16 April 1906 at MI. She was the daughter of Frank Levi Holcombe and Ella Jane McLaren. Mildred Arbutus Holcombe died in September 1906. Harry Holcombe died at birth. He was the son of Frank Levi Holcombe and Ella Jane McLaren. Viva Eileen Holcombe was born on 17 October 1918 at MI. She was the daughter of Frank Levi Holcombe and Ella Jane McLaren. Gerald Franklin Holcombe died young. He was the son of Earl Avery Holcombe and Alice McCullough. Freda May Holcombe was born on 7 May 1914. She was the daughter of Porter Weaver Holcombe and Bertha Jones. Freda May Holcombe died in infancy__. Vincent served as Sgt. in command of Isaac Phelps, Aug 18-Oct 25, 1814; became a physician at W. Granville, Hampden Co., Mass. Seaver shows the marriage date to be Jan 5, 1819. Dr. Vincent W. Holcombe was born on 5 February 1795 at Village of North Granby, Granby, Hartford Co., CT. He was the son of Alvin T. Holcombe and Mary Mather. Dr. Vincent W. Holcombe married Susannah Mills, daughter of Jared Mills II and Susannah Case, on 25 February 1816. Dr. Vincent W. Holcombe died in September 1863 at West Granville, MA, at age 68. [S25] Hannah McPherson, Holcombe Genealogy, Page 133.1/Item A-8-1-2-9-4-1. [S23] Jesse Seaver, The Holcomb(e) Genealogy, Page 59. Horace and Eunice were recorded in the 1850 Census of Colesville, Broome Co., NY with family as farmer. The birth dates McPherson gives for his children are obviously extracted from census ages. Mary 22, Leroy 20, Sally M. 19, Julia A. 16, Gilbert 13, William 11, Lucy 9, and Emily 6. Horace and Eunice were enumerated in the 1860 Colesville, Broome Co., NY, federal census, page 22 (stamped page 696). He was a farmer age 64, she was 61. Children in the household were William 20, Clarissa 19, Lucy 19, and Emily 16. There were also three children, perhaps grandchildren, in the household, Horace Covert(?) age 8, Jerome Covert age 7, and Florence Covert age 4. Horace and Eunice were enumerated in the 1865 Colesville, Broome Co., NY, state census. He was 69, she was 55. Children in the household were Lucy 24, and grandchildren Jerome Covert 12, and Florence A. Covert 9. 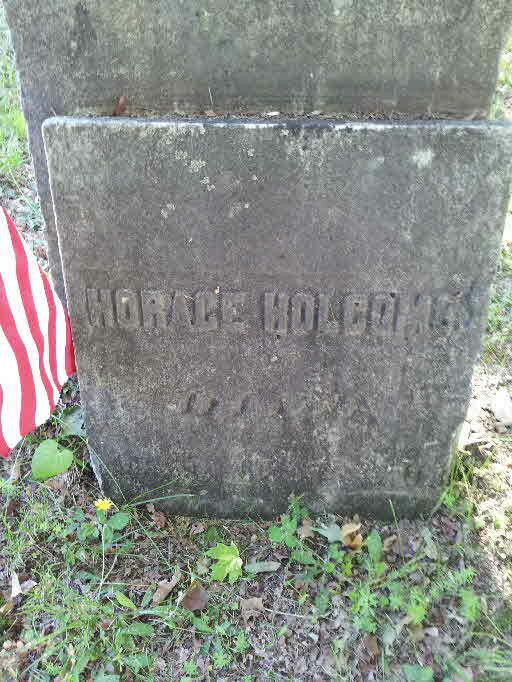 There are two graves in the New Ohio Cemetery marked as a child of "H and E" Holcomb. Both Vincent W. and Ann Eliza wouild fit into this family but with no other proof. [S25] Hannah McPherson, Holcombe Genealogy, Page 133.2/Item A-8-1-2-9-4-2. [S807] Find A Grave, online http://www.findagrave.com, memorial # 95582621. Seaver lists two Alvins, sons of Alvin T; this one that died young and the second Alvin, born 10-10-1804; McPherson only lists the one Alvin. Alvin Holcombe was born on 27 April 1801 at Granville, Hampden Co., MA. He was the son of Alvin T. Holcombe and Mary Mather. Alvin Holcombe died on 7 October 1804 at age 3. William Mather Holcombe was born on 8 January 1806 at Granville, Hampden Co., MA. He was the son of Alvin T. Holcombe and Mary Mather. William Mather Holcombe died on 12 February 1858 at age 52. Julia and John were found on the Family Search Genealogy Service, AFN: BWKC-P3. Lewis Holcombe was born on 5 December 1808 at Granville, Hampden Co., MA. He was the son of Alvin T. Holcombe and Mary Mather. Lewis Holcombe died on 12 September 1853 at age 44. He was buried at New Ohio Cemetery, North Colesville, Broome Co., NY. Susannah Mills was born on 8 May 1797 at Simsbury, Hartford Co., CT. She was the daughter of Jared Mills II and Susannah Case. Susannah Mills married Dr. Vincent W. Holcombe, son of Alvin T. Holcombe and Mary Mather, on 25 February 1816. Jared Mills II was born on 19 December 1772 at Simsbury, Hartford Co., CT. 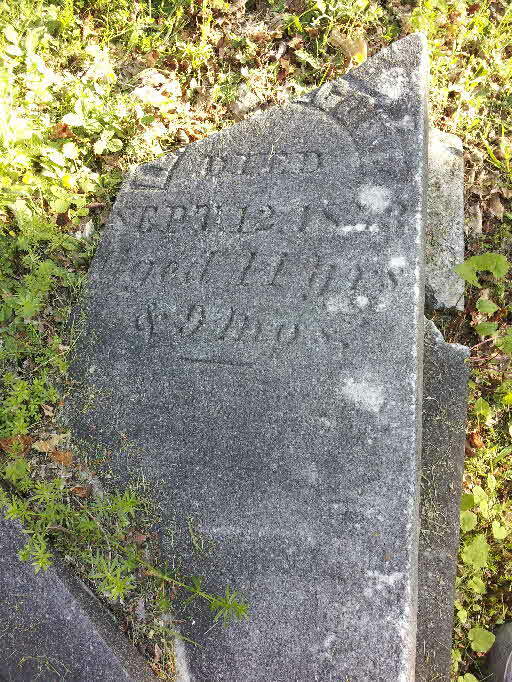 He was the son of Jared Mills and Apphia Higley. Jared Mills II married Susannah Case, daughter of Capt. Uriah Case and Susannah Lawrence, on 27 May 1793 at Canton, Hartford Co., CT. Jared Mills II died on 1 May 1821 at Simsbury, Hartford Co., CT, at age 48. [S101] Ruth Cost Duncan, John Case, Page 16/Item 22.vii.D. Susannah Case was born on 31 December 1773 at Simsbury, Hartford Co., CT. She was the daughter of Capt. Uriah Case and Susannah Lawrence. Susannah Case married Jared Mills II, son of Jared Mills and Apphia Higley, on 27 May 1793 at Canton, Hartford Co., CT. Susannah Case died on 21 May 1808 at Simsbury, Hartford Co., CT, at age 34. [S101] Ruth Cost Duncan, John Case, Page 16; Page 32/Item 56.iv. Jared Mills Holcombe was born on 5 May 1821 at Granville, MA. He was the son of Dr. Vincent W. Holcombe and Susannah Mills. Jared Mills Holcombe died young at Granville, MA. Hubert Holcombe was born on 10 May 1826 at Granville, MA. He was the son of Dr. Vincent W. Holcombe and Susannah Mills. Hubert Holcombe died young at Granville, MA. Hubert Vincent Clairbone Holcombe was born on 5 January 1828. He was the son of Dr. Vincent W. Holcombe and Susannah Mills. Hubert Vincent Clairbone Holcombe married Eunice Anise Squires on 16 August 1852. Hubert Vincent Clairbone Holcombe married Mary Jane Hill on 6 September 1865. Hubert Vincent Clairbone Holcombe died on 14 August 1874 at Branford, New Haven Co., CT, at age 46. Enlisted as Asst Surgeon, Aug 4, 1862, in the 15th Regiment, Connecticut Volunteer Infantry, organized at New Haven, Ct; promoted to Surgeon. He also served in the 8th Regiment, Connecticut Volunteer Infantry. Hubert and Eunice were enumerated in the 1860 Branford, New Haven Co., CT, federal census. He was a physician, age 32, she was 30. Also in the household was Lucy Hillurn 15. 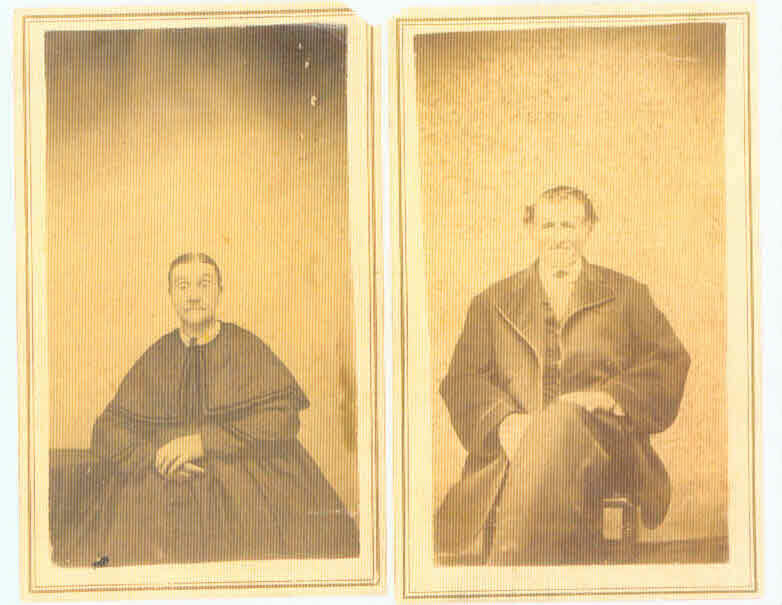 Hubert and Mary J. were enumerated in the 1870 Branford, New Haven Co., CT, federal census. He was a Physician age 42, she was 30. There were no children enumerated. Seaver shows that Hubert V. C. Holcombe had 3 children, Charles, Susan and Elizabeth; however the birthdates he gives clearly makes them siblings of Hubert V. C. as is shown in McPherson. [S25] Hannah McPherson, Holcombe Genealogy, Page 133.1/Item A-8-1-2-9-4-1-3. Seaver shows Charles Clifford as a son of Hubert Vincent Clairbone Holcombe; however, the birthdate makes that impossible. McPherson shows him as a sibling of H.V.C. Holcombe, after all he was born only 2 years later. McPherson indicates 2 marriages without naming either bride; Seaver lists only Agnes. McPherson indicates no children; Seaver lists Clifford Heebner. Charles received his degree from Yale Medical College in 1850; a very successful doctor at Lee, Berkshire Co., MA. Charles Clifford Holcombe was born on 25 January 1830. He was the son of Dr. Vincent W. Holcombe and Susannah Mills. [S25] Hannah McPherson, Holcombe Genealogy, Page 133.1/Item A-8-1-2-9-4-1-4. Elizabeth Phelps Holcombe was born on 25 July 1832. She was the daughter of Dr. Vincent W. Holcombe and Susannah Mills. Elizabeth Phelps Holcombe died on 16 October 1891 at age 59.